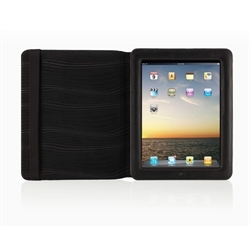 Designed from leather and with an microfiber inner lining, not only will this protect your iPad from bumps, knocks and scratches but you'll also look quite professional with this leather folio. Presented in black, the Leather Folio for iPad from Belkin is relatively quite light and does not add any additional weight onto your iPad that you definitely don't notice. To install it, all you need to do is slip your iPad into the folio and presto, the installation is complete. I would recommend a screen protector however in order to ensure total protection for your iPad which can be purchased separately and definitely go for the Belkin one. Also, as the design is presented as a "book" where you need to open the folio to use the iPad, it's actually quite comfortable and allows you to hold your iPad more like a book than a pad. This is perfect for lounging on the couch, sitting on a train or taking a flight across the Tasman. The interior material is also quite soft that will not cause any damage to your iPad and lastly, the folio can be closed securely to ensure that it does not open at the most inappropriate times.